With the support of our team members, we bring manufacture and supply Three Deck Ovens. As per the rising and changing demands of our patrons, we are immersed in providing an extensive Deck Oven. Tray Size: 16" x 24"
Two-door model of GN 2/3 pizza oven with infrared quartz elements (1050°C) and fistone for fast and crispy cooking of pizza, quiche, lasagne, pies (pizza oven function), gratinées, flambées, cheese sandwiches (salamander function), bread, tarts, focaccia, pastries (bread oven function). 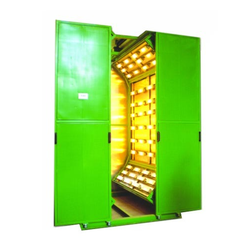 We are offering a large range of excellent quality Deck Oven to our clients, widely appreciated for its high dimensional accuracy and sturdy construction. We offer such Deck Oven which are extensively known for their ample space and high functionality. These are fabricated at vendors end by using high quality steel under supervision of their efficient technical team. 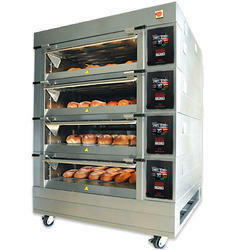 - Deck ovens are perfect and suitable for baking almost all products ranges. - The steam device can be used for making crisp crumb for products like French loaf, country breads etc., . Thermolab Scientific Equipment Pvt. Ltd.
Our clients can avail from us an array of Deck Oven, built on the basis of advanced technology. Appreciated for their sophisticated and classy designs, these ovens are easy to operate.